Children’s spectacle frames like yours, but more fun to shop for. Searching for the right pair of spectacles can be confusing. You’ll see plenty of children’s spectacle frames, but how do you figure out which one’s your child is willing to wear, and which one’s will last longer than the ride home? Your optician will make specific recommendations about suitable spectacle frames, but often the decision is left up to you and your child. Modern children’s spectacles boast durability and safety features. With so many new styles, you and your child are sure to find a pair of spectacles you both will love. Choices range from brands based on popular characters or childhood icons such as Harry Potter, to adult styles, or a mix of both. 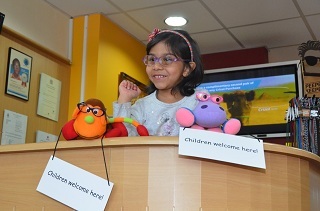 You’d be pleased to know that we offer free children’s eye tests and spectacles on the NHS voucher scheme. You can also upgrade to unbreakable, polycarbonate lenses at a small cost. Because children can be tough on their eyewear, it’s always a good idea to purchase a second, or backup pair of spectacles. This is especially true if your child has a strong prescription and cannot function without his or her glasses. If your child wears spectacles full time (including outdoors), photochromic lenses or prescription sunglasses should also be considered to decrease glare, increase visual comfort, and provide 100 percent protection from the sun’s harmful UV rays.